It has been a trying winter at the Writing Studio and Bait Shop, but I see no reason to drag you through the worst of it with the rest of us. I believe I’m going to show you some of the best parts instead. How about if we start with these snapshots, proof that a nice, solid wintry day can be very pretty, especially when a person is toasty warm inside the car with the heater going. Now I will admit that the street signs at Buckley and Park were pretty hard to see behind the snowpiles, but I sort of scrunched down to get the full effect. 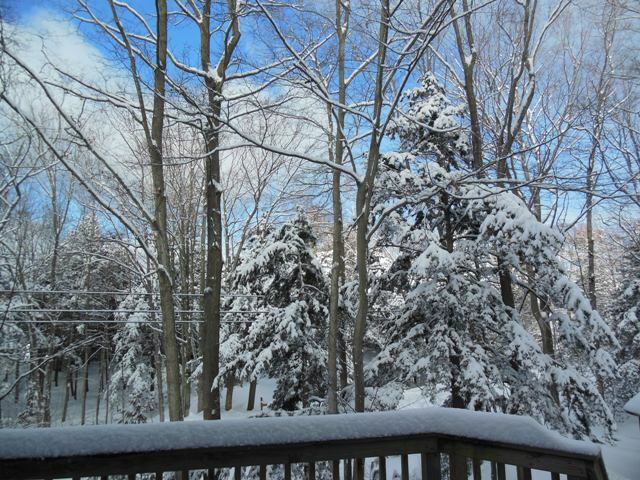 It was pretty last Saturday, too, from the deck at the Writing Studio and Bait Shop. Of course now it’s Tuesday, and we aren’t going to talk about Tuesday. There is only one problem with those particular photos. I promised Jack Bodis that I would post something cheerful and un-wintry. Hmmm. OK, here you go, Jack. 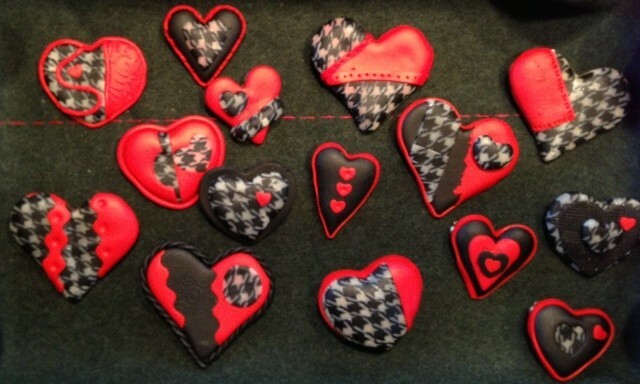 Babs made some polymer clay hearts for Valentine’s Day. If that doesn’t cheer you up, how about this? The Cowboy is dreaming of spring, too. Looks like a perfect little angel, doesn’t he? Ha. Nice to see a new post and a mention of what’s what in your part of the world. Don’t scare me. I haven’t forgotten March 2012. Yikes. I am getting out and about a bit–have been following your house-hunting adventures on my RSS feed. I have to get to the library’s broadband more often. All these photos are beautiful, Gerry, but I think my favorite is that Hollywood soft-focus portrait of the innocent, dreaming Cowboy. Even though we know better! We do indeed. The soft-focus was entirely an accident, and it made the little dickens look like one of those angel tree-tops made of clouds of fiberglass. So pretty, so soft . . . so endlessly itchy after it worked its way into our hands. I see that you have had some snow then. Sorry! I don’t remember March last year at all. Let’s say it’s going to be daffodils and tulips all over. Oh, and no ice killing off the orchard bounty. That I DO remember. I’d settle for a gradual warm-up leading to a bountiful season in all our orchards. I am glad you were able to get back to your blog. Me too, me too. It was nice to work at the kitchen table over in Blue Heaven while the wind boomed and thumped outside. Aaaah, what a little babe, so lovable when he’s asleep! I remember when my son seemed like that, when he was … not awake. When he was a toddler, Rob the Firefighter looked particularly angelic when he slept, too – though I suspect he spent his downtime dreaming up new mischief for his waking hours. Thank you, d. I hope to spend a little time this week catching up on the rest of the blogosphere. I love those hearts Babs made, and of course the photo of The Cowboy. The hearts make me think of tootsie rolls. I wonder if anyone’s ever made a concoction from Tootsie Rolls? Maybe under the influence of cabin fever. That’s a passle of snow. There are some folks south of you who are hoping for more of that before winter’s over, just to spiff up the fields and their moisture level. I suspect you’re ready to be shut of it, as my grandma would say. A concoction of Tootsie Rolls is completely outside my experience, but I consulted my favorite guide to such things, Carole Eberly’s Potato Chip Cookies & Tomato Soup Cake: Recipes of Americana. Nope. You’re on your own. I hear it’s snowing up above L.A. and that the storm is heading east. It would be OK with me if it went to Texas instead of coming up here. Spread the wealth, sez I.
Brrrrr, and I thought we had a lot of snow around here after Nemo! I can find some snow piles like yours in local parking lots for the supermarket and such. I’m with the Cowboy – dreaming of spring! 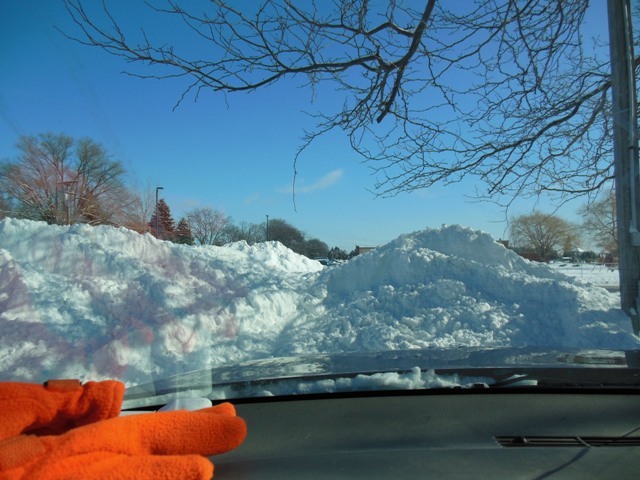 Full disclosure–those photos were of parking lot snowpiles too, although they were very small parking lots and very big snowpiles. I should take a picture of my driveway snowpiles. Maybe not. Jack Bodis will never read TLV again. 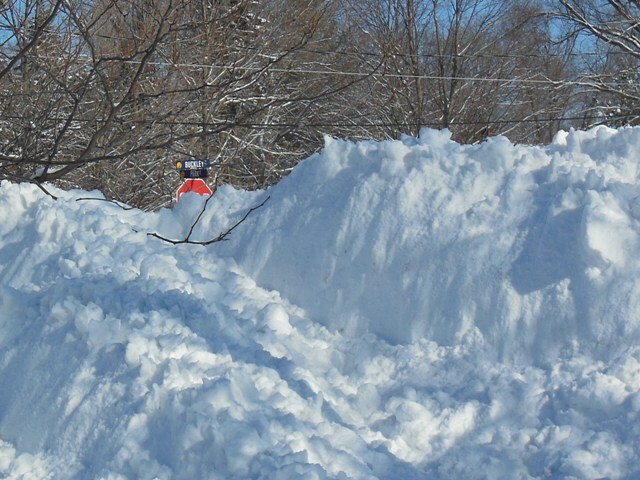 I live “across the pond” from you (Torch Lake near Clam River) and finally got out the snow blower to plow a path to the mail box. Was able to clear the driveway enough so hopefully, I can get out tomorrow. It certainly has been an adventure this year Up North! Hey, Judy – welcome. Rumor has it that tomorrow may be sunny, cold, and relatively snow-free. It is possible that both of us may get out of our driveways and our back roads and perhaps venture all the way to the grocery store, the library – who knows what wonders await us? A phrase from Maurice Sendak’s newly, posthumously published work “My Brother’s Book” seems acutely apropos: “slanting wide the world to the winter side.” Keep warm. Now that is some righteous phrase-slinging. I must look for the Sendak book. It sounds good for a long winter’s read. And you are even going to have some spring I gather. We, on the other hand, are in for weeks of winter, and just happy to see a little sunshine on the snow. Beats the snow on the snow, and the rain on the snow, and the wind blowing more snow around on top of the ice and snow. Yay sunshine. We have had more snow this year than other recent winters. Of course my memory is short. Still, almost all is gone now other than small remnants of past shoveling. Katie would like more please. Silly girl. Love the hearts and the puppy. Hope you are able to get out some before the next big storm. I know it’s a long way till spring, but still….Feb is a short month…and it’s almost over…and truly by the end of March we should get some relief broken only by smaller snow squalls…if we are lucky. Katie is welcome to some of our snow. We seem to have acquired a surplus. We are going out today while the going is good. OK, sort of good. Not awful. It’s good to have dogs around when the going gets awful. They give a person a focus. Also a laugh and a lot of warmth. Good companions, dogs. How come you got as much snow as we got here in the Alps ? I think The sweet and angelic Cowboy found the solution : sleep and forget all about it. And dream of black and red heart shaped cookies. Nice to see you back, Gerry.